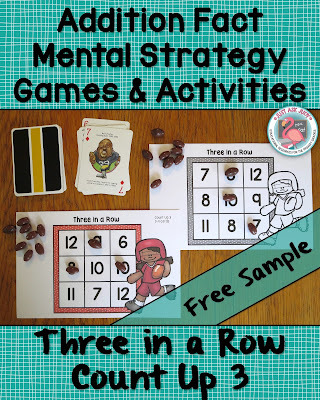 Are you looking for engaging games and activities to help your students develop fluency with adding basic facts? Do you have students who require frequent practice to learn and apply addition fact strategies? 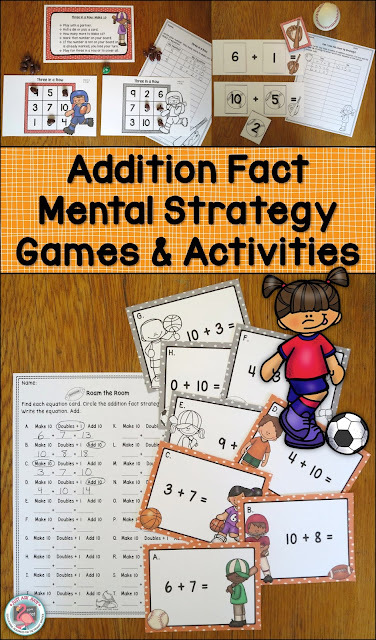 If the answer is yes to either question, the plethora of resources included in my Addition Fact Strategy Games & Activities might be the perfect solution. You can sample five of those activities for free! 1. Three in a Row- Count Up 3 is a partner game for applying the Count Up/ On addition fact strategy. Materials needed to play are one game board per player, number cards 3-9 (2-4 sets), and markers to cover your numbers. I just happened to find these team football cards amongst my husband’s sports memorabilia but all you need is a regular deck of cards! 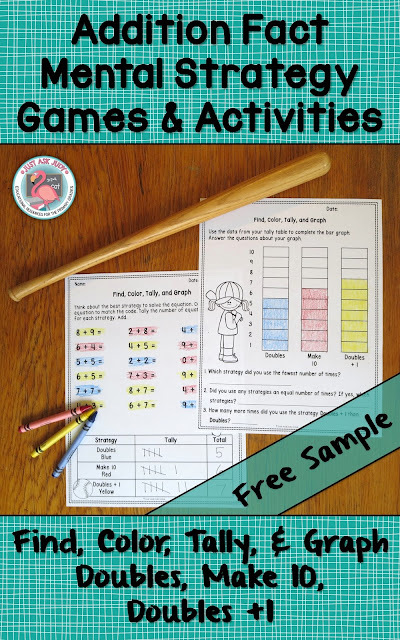 Further explanations and directions for each game and activity are included in the free sample. 2. 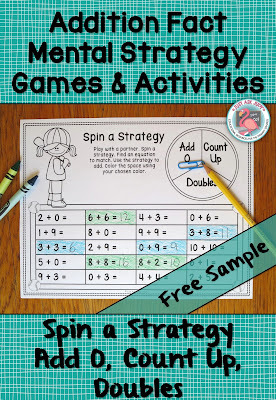 Spin a Strategy is another partner game that requires discriminating between three strategies; Add 0, Count Up, and Doubles. One game sheet, two crayons of different colors, a paper clip, and a pencil are needed to play. 3. Can I Use This Strategy? Make 10 is an activity which can be completed by individuals, partners, or small groups. Each student will need their own recording sheet. Four sets of numbers 1-10 (ace as 1) are needed. Students can be expected to complete this activity in different ways, depending on their reasoning ability and skill level with decomposing numbers. 4. Find, Color, Tally & Graph (Doubles, Make 10, Doubles + 1) is an individual activity for discriminating between strategies. Print the two pages, add crayons, and a pencil and you’re all set! The miniature wooden bat is a baseball team souvenir which I found hidden in a cabinet filled with baseball memorabilia. Based on the team name, I can only surmise that it was a gift given to my husband at least 25 years ago! 5. 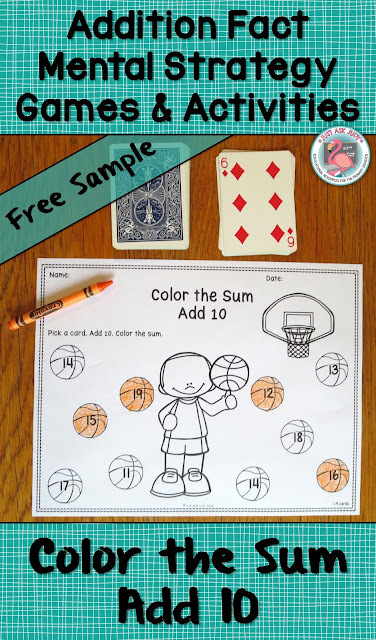 Color the Sum is a partner game or small group game that focuses on the Add 10 strategy. Each player needs their own paper. Use cards 1-9 (an ace for 1) from a deck of cards, 1 set per player. Check out this Pinterest board for more math ideas and resources!